The aptera of Aphis coronillae is dark brown to brownish green with a more or less shiny black dorsal shield and no wax powdering. The shield extends over segments 1-6 inclusive, but is weakened by membranous lines between some of the anterior segments. 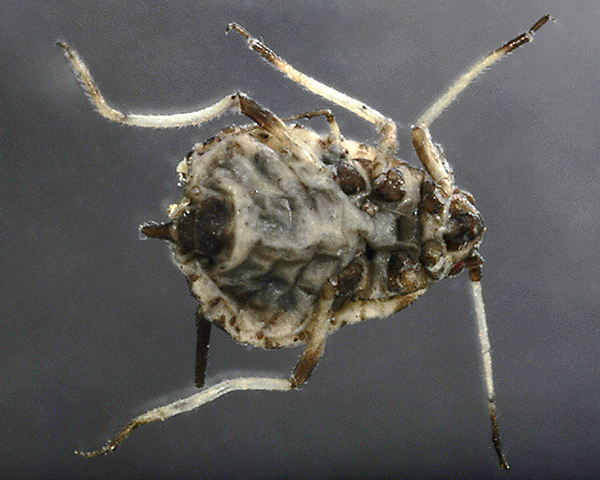 The shield is reticulated, a feature formerly only thought to be visible in slide mounted specimens, but also clearly shown in our photo of the live insect (see first picture below). Abdominal tergites 1-4 and 7 regularly bear very protuberant, dome-shaped marginal tubercles (cf. 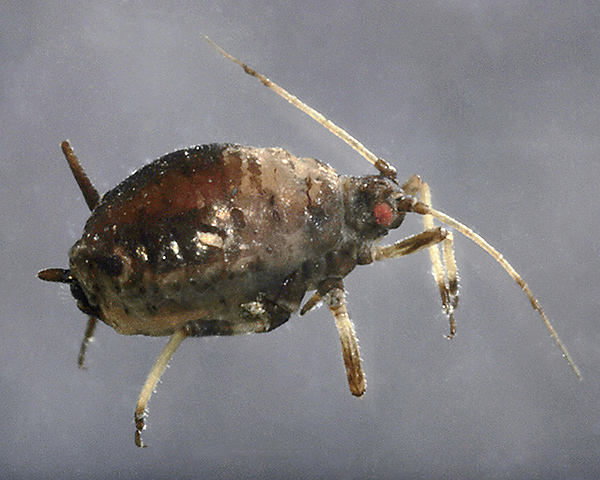 Aphis craccivora where tergites 2-6 are usually without marginal tubercles, or rarely with 1-3 small ones). Nearly all the hairs on the legs are very short. 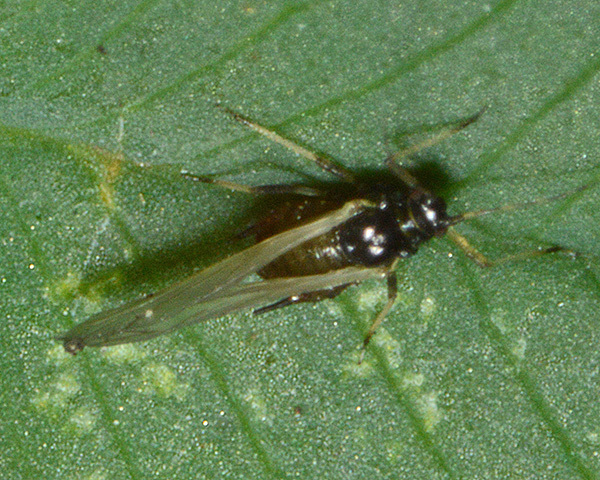 The body length of adult Aphis coronillae apterae is 1.3-2.2 mm. Immatures range from greenish-yellow (the youngest) to reddish brown (fourth instars). Aphis coronillae alatae have 3-9 secondary rhinaria on antennal segment III, and 0-2 on segment IV. Aphis coronillae coronillae (clover aphid) lives on Trifolium species. Aphis coronillae arenariae (medick aphid) lives on Medicago lupulina. 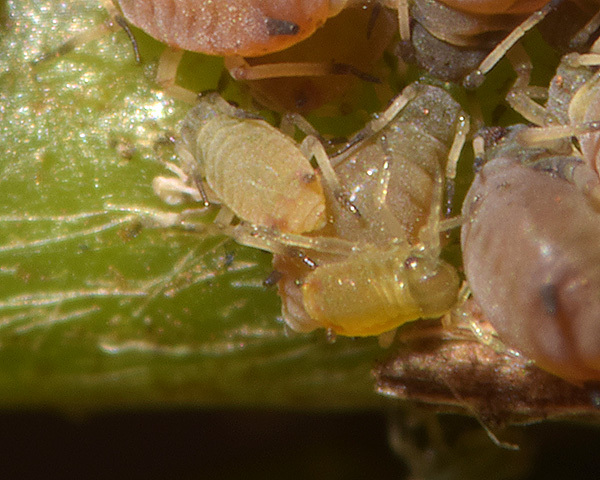 Most of the aphids pictured on this page are Aphis coronillae arenariae. Aphis coronillae lives on the basal parts of certain Leguminosae / Fabaceae, especially clovers (Trifolium) and medicks (Medicago). It does not host alternate. Sexual forms appear in September. The males are mostly apterous, but are occasionally brachypterous or alate. Aphis coronillae is usually attended by and sheltered by ants. It is widely distributed in Europe, and is also found in west Siberia. 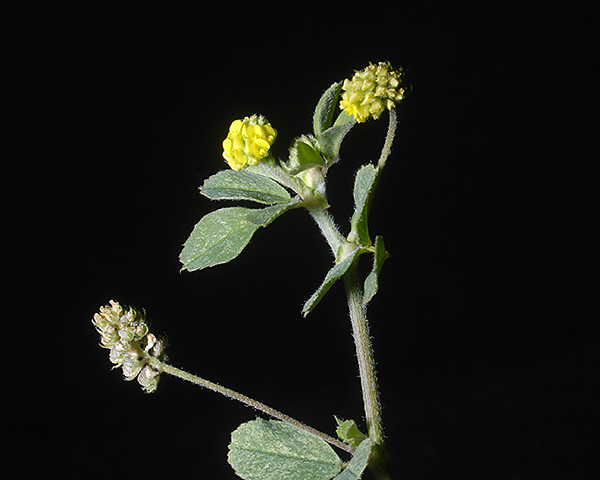 One of the main hosts of Aphis coronillae is black medick Medicago lupulina (see picture below), a very common herb found in pastures and lawns. It is a pioneer plant often growing in disturbed ground, and is especially fond of xeric habitats such as pavements in residential areas. 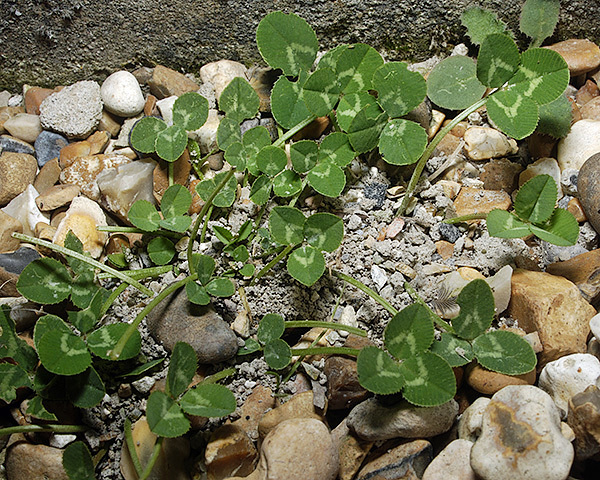 We have found Aphis coronillae in two locations - on black medick growing in and around pavements in an East Sussex village (see pictures above), and on clover growing around farm buildings at Middle Farm, East Sussex (see picture below). The apparent scarcity of Aphis coronillae is doubtless enhanced by its subterranean feeding site. 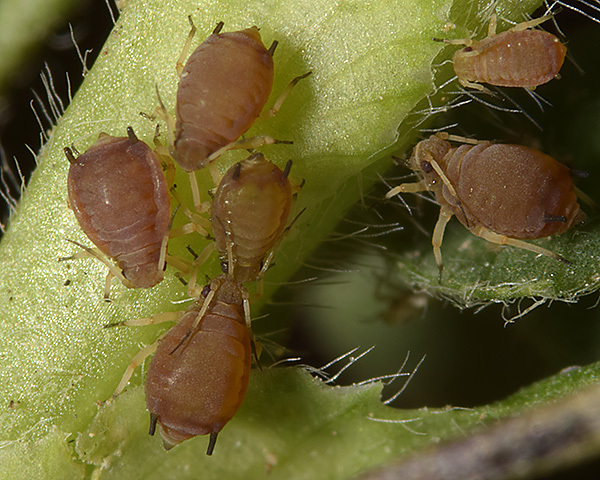 The only indication of the aphids' presence is tenting with debris over infested runners by attending ants. The common black ant (Lasius niger) is usually the species that carries out the earth tenting and attends the aphids. 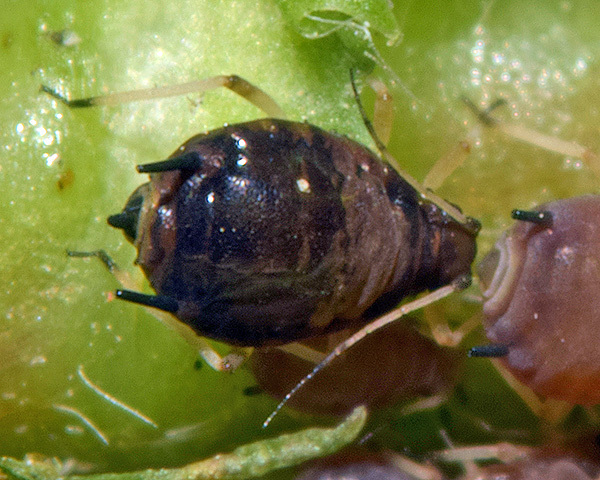 First and second instar Aphis coronillae (see picture above) are yellowish-green with some reddish coloration near the siphunculi. 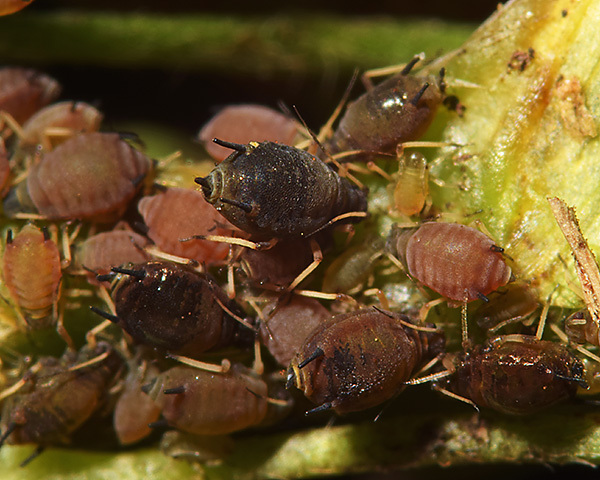 By the third instar (see picture above) they are a rich reddish-brown. As they develop to adults, they acquire a more-or-less shiny black dorsal shield. The extent of this shield is somewhat variable. In the adult below, it is rather more fragmented than on the adult shown at the top of the page. 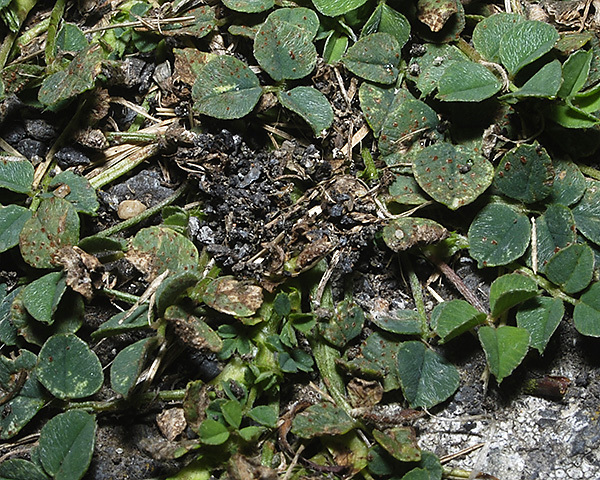 Baker (2009)reports finding Aphis coronillae subspecies arenaria on subterranean parts of Medicago lupulina, growing on 'brownfield' land in Cardiff Bay during summer, 2007. It was sheltered and attended by the ant Lasius niger. There are also recent reports from Switzerland (Lethmayer, 1998), West Siberia (Stekolshchikov et al., 2008) and Greece (Tsitsipis, 2007). Blackman & Eastop list 10 species of aphid as feeding on black medick (Medicago lupulina) worldwide, and provide formal identification keys. 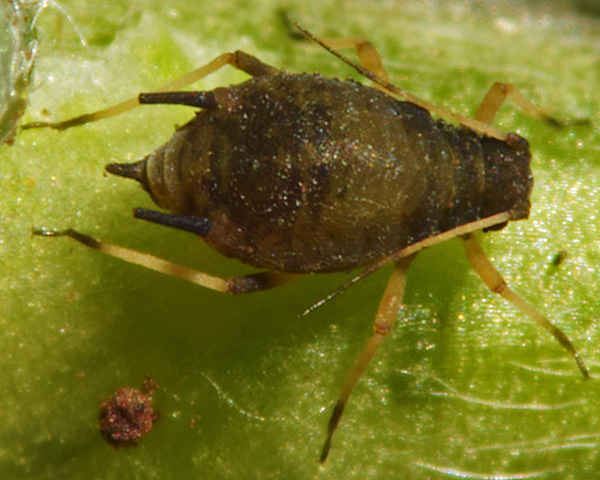 Of those aphid species, Baker (2015) lists 9 as occurring in Britain: Acyrthosiphon pisum, Aphis coronillae arenaria, Aphis craccivora, Aphis medicaginis, Megoura viciae, Myzus ornatus, Myzus persicae, Pemphigus populi and Therioaphis trifolii. We especially thank Middle Farm, East Sussex for their kind assistance, and permission to sample.